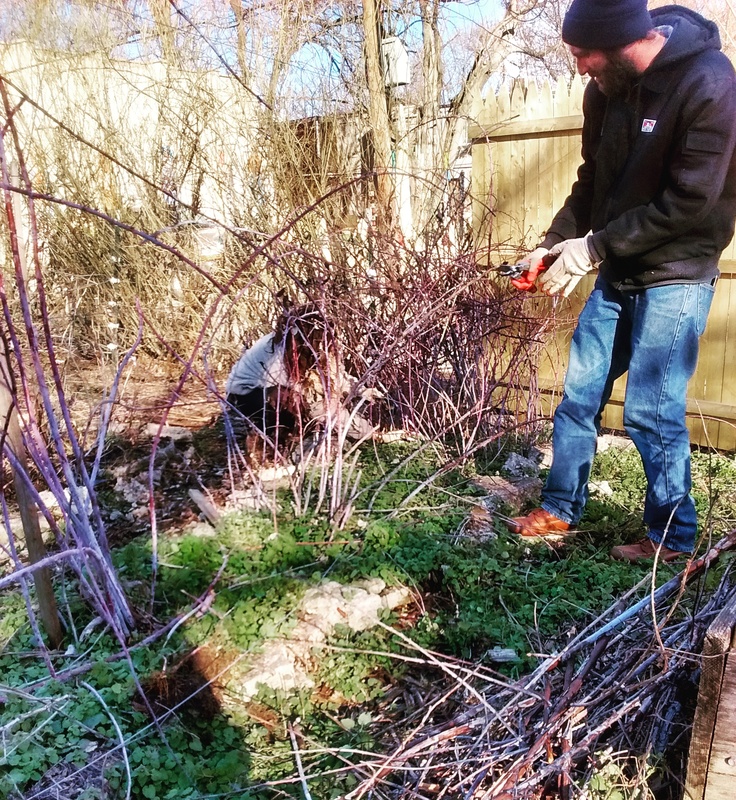 Consider this, in part, a preview to POPCORE3: Plants & Fungi We Love and What To Do With Them on March 22nd, part of our Community Orchard Resilience Education series. We hope you’ll join us to learn new ways to craft from and celebrate your orchard plantings. Shrub: a cocktail or soft drink made by mixing a vinegar-ed syrup with spirits, water, or carbonated water. Drinking-vinegars, otherwise known as ‘shrubs’ date back to colonial America when colonists used vinegar in the preservation of fruit and berries. These fruit preserves themselves, became known as ‘shrubs’ however by the 19th century, many Americans began incorporating these fruit-infused, flavored vinegars into drink recipes, utilizing the vinegar in the making of a sweet-and-sour syrup which was then topped with water, soda, or cocktails. In recent years, the shrub has made a resurgence, as both a trendy cocktail and potential dietary and weight-loss trend. As we observe the comeback of the shrub, why not highlight its use with some of POP’s favorite fruiting shrub varieties. The three species discussed below are just a few of the diverse shrub plants grown throughout POP orchards that can present gardeners with hardy, versatile, underutilized, options for hedge-lining, screening applications, and overall garden aesthetics and health – and as a bonus, they fruit too! Cornelian cherries are among the first to blossom in early winter. Their shiny, oblong fruit packs a powerful flavor punch! 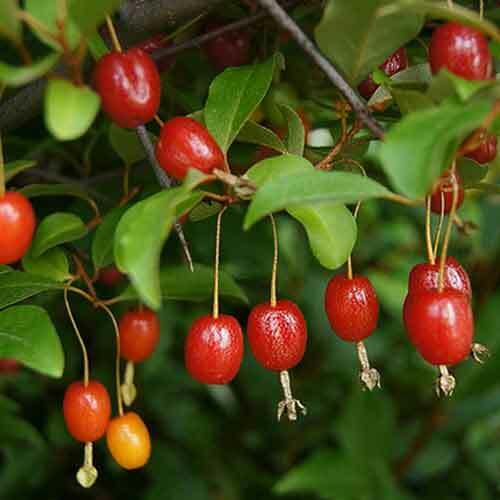 The cornelian cherry is actually a species of Dogwood, however its name originate from the small, red, cherry-like fruits resembling the gemstone, carnelian. Although native to central and southern Europe into western Asia, it is cultivated throughout the United States, specifically USDA zones 4 through 8. Relatively easy to grow, it prefers moist, organically-rich soils with sufficient drainage, in full sun to part shade. It is also shows excellent resistance to dogwood anthracnose, a fungus-caused disease, and dogwood borer, a species of moth. 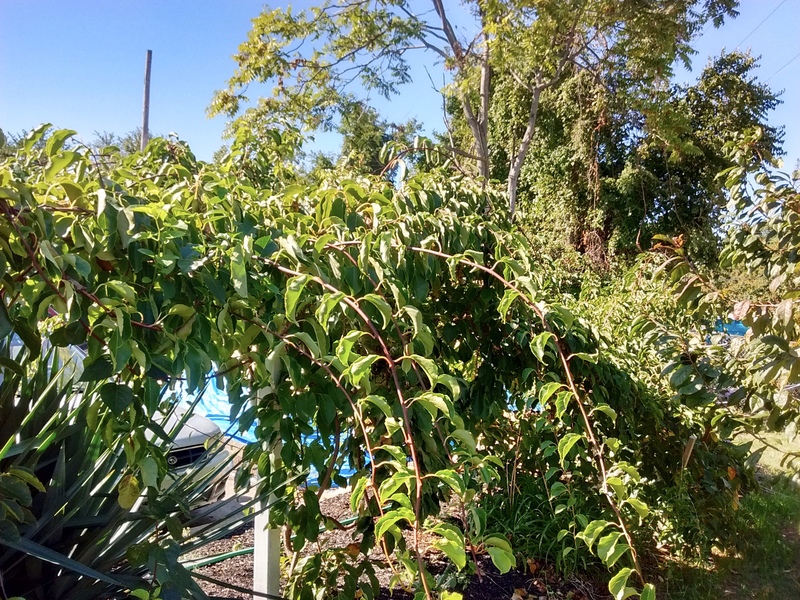 Growing to approximately 15-25 feet tall and a spread of about 12-20 feet wide, the cornelian cherry is perhaps more a small multi-stemmed tree than shrub. 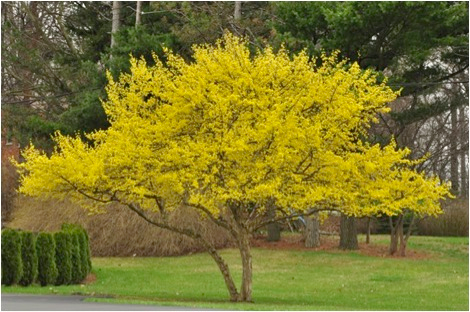 It is one of the first of any woody plants to bloom in late Winter to early Spring, presenting a display of yellow flowers even before Forsythia. Light-red, oval, pitted, fruits emerge in early to late spring, turning darker-red as they ripen in mid-summer. When picked prior to ripening, they present a very sour, astringent taste; however when fully ripe, they are much sweeter although still a bit tart. There are also some yellow-fruited varieties that in POP orchards seem to be sweeter and less prone to bird predation. 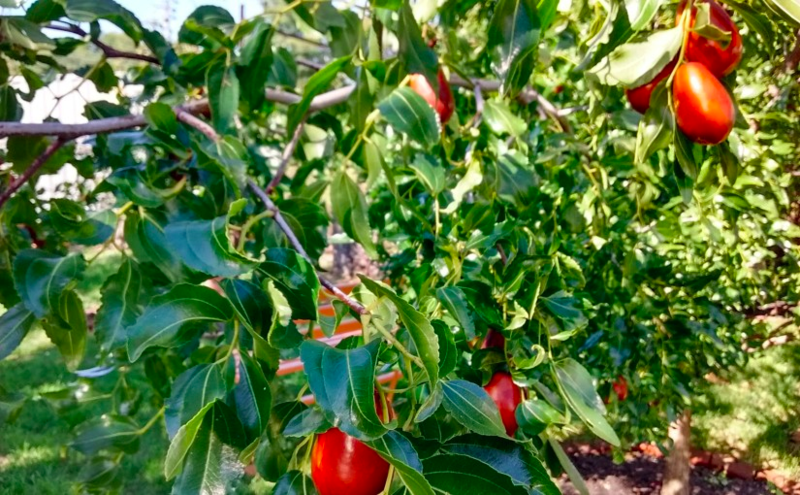 A key nitrogen fixer for the orchard, goumis are versatile plantings – cold-hardy, reliable, steady producers with a flavor profile unlike any other! Another non-indigenous shrub, the Goumi hails from eastern Russia, China, and Japan. Although it was introduced to the United States over one hundred years ago it remains an underutilized species. The goumi is a winter-hardy shrub, semi-evergreen, easily grown throughout USDA zones 4-9, preferring medium moisture, well-drained soils in full sun to part shade. Although it will tolerate a variety of soils, avoid those that are overly wet and that drain poorly. The goumi grows approximately 6-10 feet tall, significantly smaller and less wide than the cornelian cherry. Early spring blooms give way to small, yellowish, fragrant flowers that draw an array of pollinators. Goumi shrubs are also nitrogen-fixers, thereby releasing nitrogen following pruning, which ideally should be done after fruiting in mid to late Summer. Goumis are often the first fruit of spring, sometimes ripening as early as May. The red, oblong, fruits are mildly astringent when not fully ripe but become sweeter and darker in color the longer they remain on the bush. Goumis have performed and produced fantastically well in POP orchards in a variety of settings. Honeyberries ripen two weeks before early-spring favorite: the strawberry. 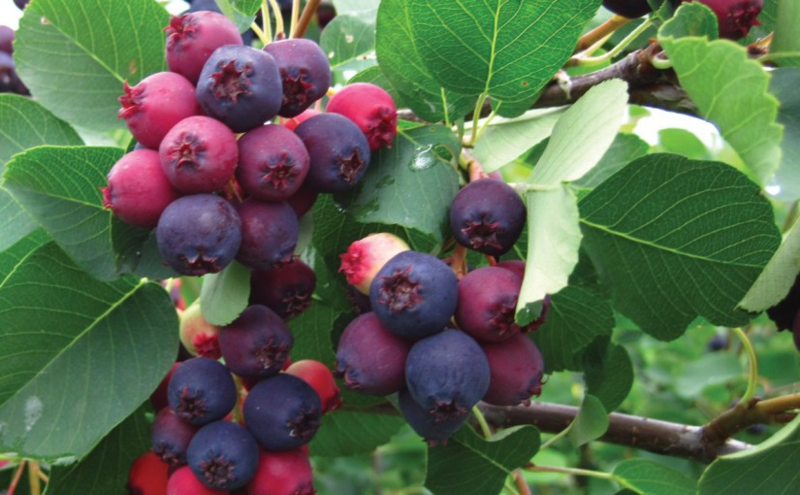 Consider planting the honeyberry in your orchard to widen the availability of early season fruit! 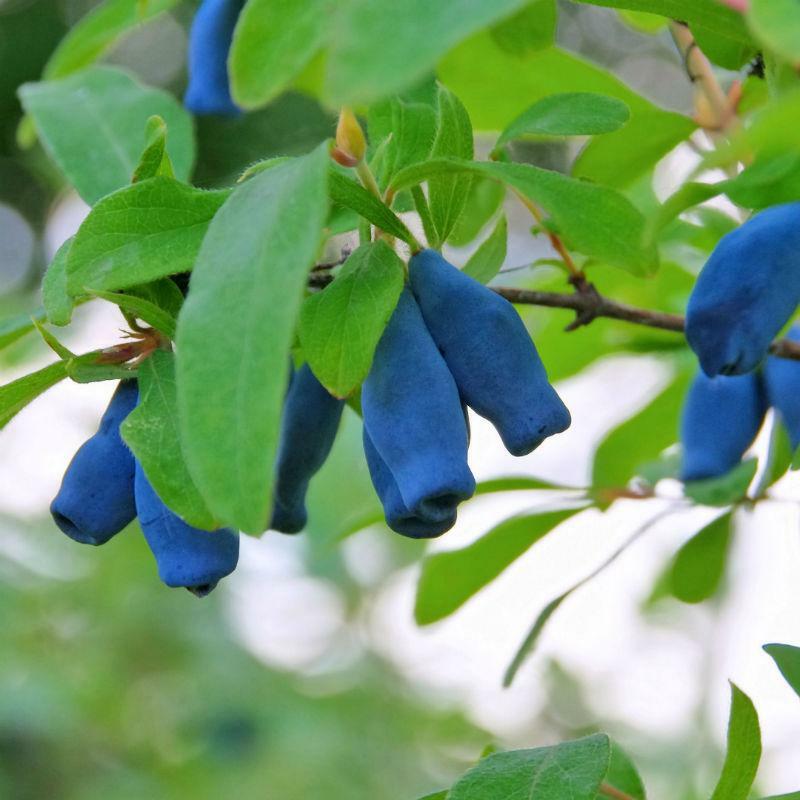 Going by a number of names (blue honeysuckle, sweetberry honeysuckle, haskap), the honeyberry is native to moist, boreal forests throughout the world, including the United States, but also in Asia and Europe. Another winter-hardy shrub, it will grow across USDA zones 2-7. However, when grown south of zone 7, plants may not receive enough chilling hours in winter to produce abundant fruit. Shrubs prefer organically-rich, moist but well-drained soils. Consistent moisture appears particularly vital for the honeyberry, although once established the shrub shows some drought tolerance. Use of mulch typically helps to retain moisture around the growing area. Unlike the goumi, honeyberries are not self-fertile and therefore need to be planted in pairs or in groups. A bit smaller than goumi, the honeyberry grows approximately 4-6 feet tall with attractive grayish-green leaves and pale yellowish-white flowers the bloom in late Spring to early Summer. Unlike many of its honeysuckle relatives, the honeyberry produces an edible, blueberry-like fruit. Appearing in mid to late Spring, the small, teardrop, almost bell-shaped fruits, ripen in mid-Summer, presenting with a brilliant blue exterior, and dark, reddish-purple insides. Unfortunately, honeyberries have not performed well in POP orchards, perhaps because we are at the southern edge of their preferred temperature zones. All three species present with a variety of nutritional benefits. Like many more commonly utilized berries, the cornelian cherry, goumi and honeyberry offer a rich concentration of antioxidant compounds. Despite their lack of notoriety in the mainstream fruit market, quite a bit of research has focused on these species, particularly the cornelian cherry and honeyberry, for their ability to reduce inflammation, thereby reducing risk of atherosclerosis and other disorders where high blood lipids or high blood sugar may be associated. Less work has been done on the goumi thus far, however it’s close relative, the autumn olive (Elaeagnus umbellate), has been studied a bit more and has shown to possess similar concentrations of antioxidants and ant-inflammatory compounds. Apart from enjoying raw, there are a variety of applications for which these fruits can be utilized including jellies and jams, pies and other pastries, ice creams and sorbets, sauces, juices, or even wine. In sticking with our ‘shrub’ theme, however, here are three original recipes featuring each of our above-mentioned shrubs in a refreshing drinking-vinegar that can be enjoyed with or without an accompanying spirit. These components are then heated together in a saucepan to dissolve the sugar and release the flavors of the fruit and other herbs or spices. 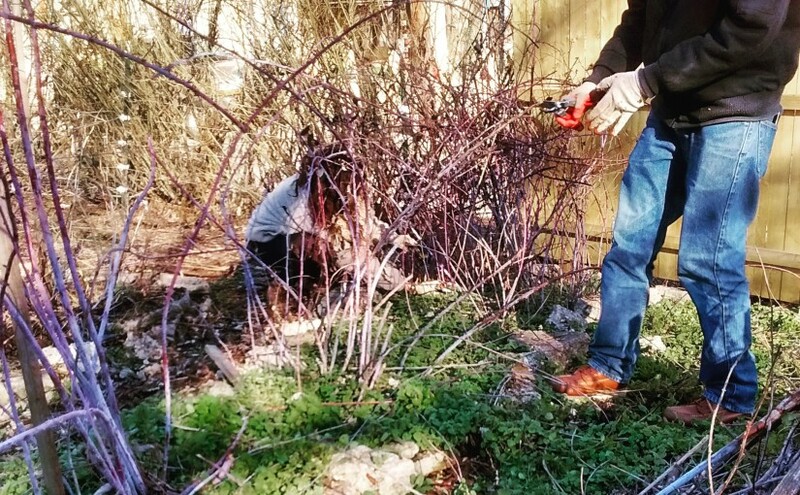 For an in-depth description on shrub-making, click here. We don’t know if there was an actual person named Cornelius who enjoyed the refreshing taste of Cornelian Cherry shrubs in the days of colonial America…but don’t you think there should be…. The name and color of this drink give way to the ominous, angry seas and devil-may-care pirate days of yore….it’s also just a corny play on a Dark and Stormy – goumi is just so fun to say! With a name like honeyberry it’s hard to pass-up the chance on making a modified version of this prohibition-era favorite featuring honey and lemon – history states that the flavors were added to less-than-ideal, ‘bathtub gin’, to mask the flavor – what better to mask the flavor here than a little honeyberry vinegar! This POP blog was written by nutrition educator and volunteer blog contributor Matthew Self. On February 10th 2018, more than 20 people gathered at Awbury Agricultural Village to learn about some of the “unusual” fruits that POP plants and why. There were some great takeaways from this workshop including learning more in depth about some of the less common options available to Philadelphia-based orchards. The most important piece from my perspective, was understanding that these “unusual” fruits were not just exciting because they were less common, but because they are also generally a lot easier to care for compared to common fruits. Apples and peaches were highlighted as being among the most challenging to grow in our climate because of intense pest and disease pressure. They and all of the other common fruits are closely related members of the Rosaceae family and are prone to a variety of growing challenges, resulting in greater need for pruning, spraying, and other maintenance requirements. By contrast, figs, paw paws, persimmons and other “unusual” fruits are less commonly planted, more distantly related, and much easier to grow and maintain. How much easier? This depends on the specific plant, but most have very few pest and disease challenges and many approach our idyllic vision of fruit growing as “plant, water, and then harvest year after year”. So it’s one thing for certain fruits to be easier to grow, but what about the other benefits? Well, with more than 30 fruits discussed, plus a handful of nuts and some zone 8 possibilities, there’s a great variety and selection to choose from, and by incorporating a diverse array of them into your growing space, you can continue to lessen the impact of pests and diseases, which favor targeting large stands of singular plantings (or ‘monocultures’) rather than having to scavenge through mixed plantings all over the city. 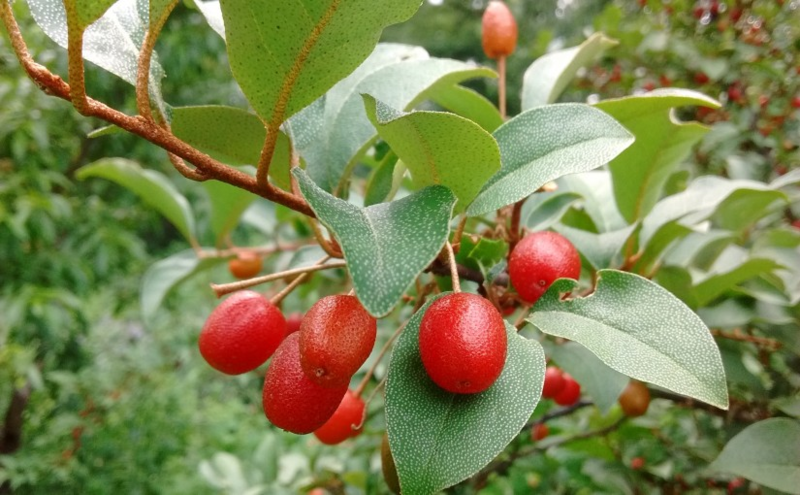 Another benefit from planting more unusual fruits is the opportunity to increase your window for harvestable fruit – beginning in May with the goumi berry, a sweet-tart berry that can be used for jellies or syrups. The goumi is a medium sized shrub that is self-fertile (meaning you only need one to produce fruit); partial-shade tolerant; and nitrogen fixing (meaning it absorbs the important nutrient nitrogen from the air and adds it to the soil near its roots, thus feeding itself and other neighboring plants). An ideal plant for food forests! Native to East Asia, the goumi fruit is an early-spring producer with tart-sweet berries that have small pits and richly speckled coral-red skin. Come June, there are many harvest options among the unusual fruit set — including the aforementioned goumi; the mulberry, beloved by birds as the sweetest fruit; honey berry, a small shrub with blueberry like fruits; alpine strawberries, which produce crops in both June and in September/October and grow low to the ground, tolerant of partial-shade, and in addition to producing sweet berries, are also quite attractive; and of course juneberries, which get their name from the their ripening month. 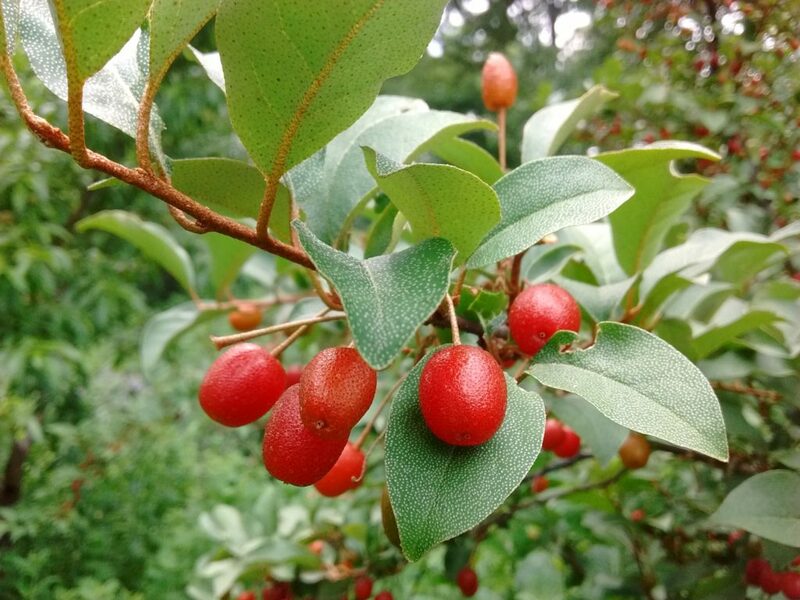 A true POP favorite, juneberries (also known as serviceberries) have a widespread presence in Philly as a native planting that is frequently featured as a street tree throughout the city. As the native Juneberry tree ripens, the berries turn from magenta into a deep blue-purple and their flavor develops with its signature blueberry-almond-cherry notes. If you’re interested in getting a more hands-on experience with juneberries, keep a look-out for POP’s 3rd annual Juneberry Joy week in Spring 2018. We’ll be harvesting juneberries from throughout the city with volunteers and then partnering with local businesses to feature some delicious juneberry products. In July at the peak of summer, your options are a’plenty! Nanking cherries, black, clove, red and white currants, gooseberry, jostaberry, and beach plum are all in fruit this time of year. 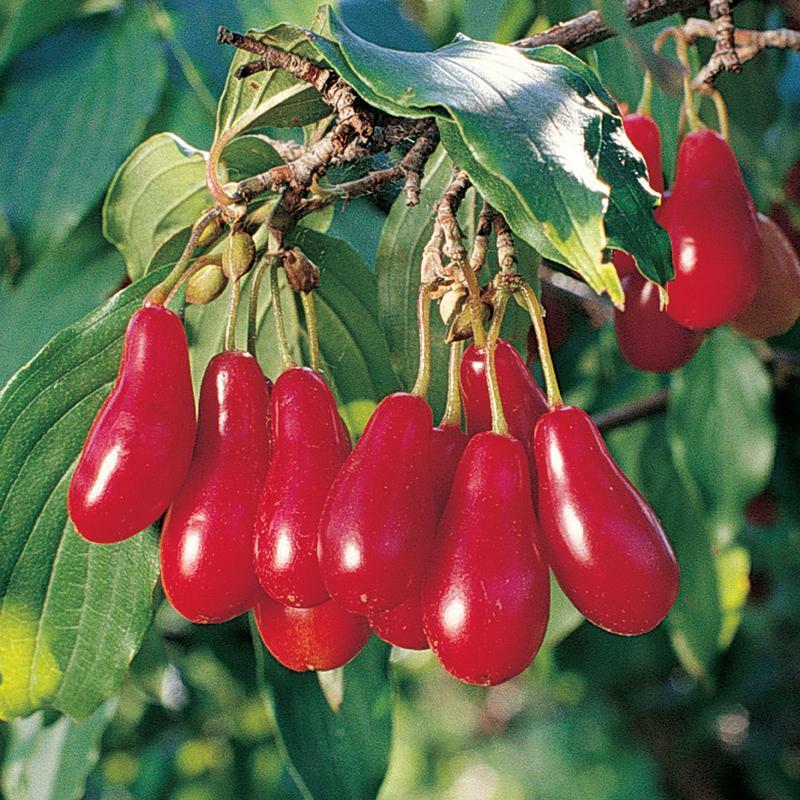 These mostly small and medium shrubs offer a variety of tasty, healthy fruits; nanking cherries are quite productive and ornamental; and currants are especially shade tolerant. 2016 intern Lucia Kearney harvests Nanking cherries at Awbury Arboretum. From August through November, another 15+ shrubs and trees enter their prime blossoming and fruit period: figs, paw paws, persimmons, jujubes, cornelian cherry, elderberries, and hardy kiwis, to name a few! Jujubes (aka Chinese red date) at the SHARE orchard. This fruit has been cultivated for four thousand years and features vitamin C-rich fruit that are easy to grow and very productive! By working with a diversity of plants, POP orchards are able to meet a wide range of needs, whether it be producing fruits for specific times of the year (useful to consider for school orchard sites) or throughout the entire year, providing benefit to the community as well as to pollinators, offering a variety of food crops that can be used to make value added products, frozen, dried, or of course eaten fresh! One of the first trees to flower in late winter/early spring, cornelian cherry of the Dogwood family provides fodder for early pollinators like birds and bees! It’s exciting to know that there are so many options for low-maintenance fruit-bearing shrubs and trees that provide so many different benefits to the orchard. If you’re interested in learning more about these easy-to-grow options, below is a list in order from most recommended (for both ease of care and deliciousness) to least recommended. Also, I would be remiss not to mention the AMAZING paw-paw pudding Phil provided at the end of the workshop – which was a real treat! This POP blog was written by 2018 Events & Education Intern Alex Zaremba. Every year we ask our orchard partners to reflect on the season and to share stories with us about what the orchard provides for their community. 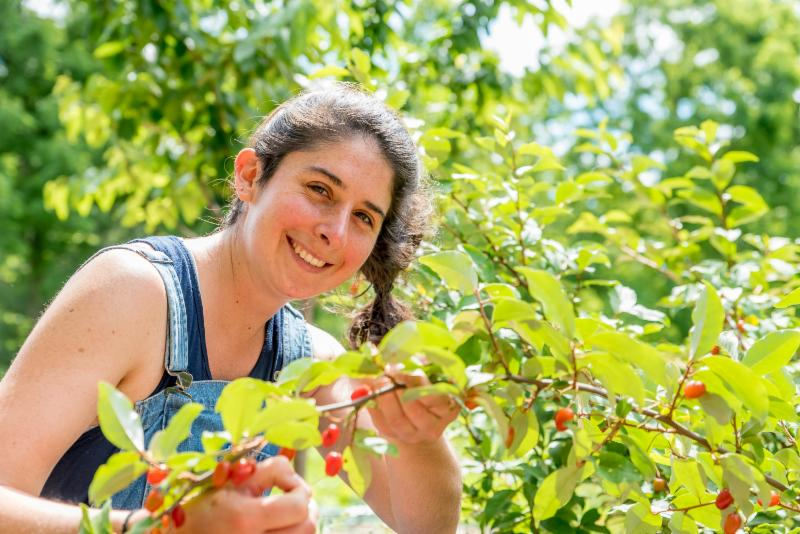 Below are some of our favorites excerpts from 2016 celebrating the beauty, abundance, and power of orchards to serve as an engaging place of discovery and connection. This year, our tiny little asian pear trees fruited. We planted them two years ago. Each pear was perfect. We must have harvested 20 lbs of pears–and those are only the ones that I was around for! Many neighbors for about two weeks were walking around, munching on pears. For two more weeks, I had people coming up to me saying, “Are there any of those pears left? They are so good!” I told them that in five years there would be more fruit growing here than we can imagine. They’d always smile like they were watching something incredible far away. I like seeing people imagine their fruit trees five years bigger. The sweet-tart fruit of the nitrogen-fixing goumi at Awbury Arboretum. I remember bringing a regularly visiting Awbury volunteer group of men to the POP orchard one summer day last year to help. We were weeding I think. It seemed sort of boring at first, but then someone offered us to try goumi berries off a bush that was full and ripe with the berries. At first my group was hesitant, saying they had never heard of the fruit, but I think all the men and everyone else there eventually tried the goumis, and this had an interesting effect our experience that day in the orchard. We began to talk about fruits we liked growing up, remembering what plants our families grew in their gardens, and sharing almost forgotten herbal home remedies for illnesses our parents gave to us. The time we spent in the orchard that day helped us get to know each other more and brought us closer together. I can see how gardening is a comfort and life changing at the same time. It reminds us of so much; yet it also spurs us to take hold of the present and dare ourselves. It helps us to try new things and to still reflect on our experiences and learn more about ourselves and each other. One Saturday, when a few volunteers were working in our train station garden, a woman using a cane appeared among us with a hand outstretched. It turned out she is a neighbor who is a retired professional gardener and now takes the train every morning to Chestnut Hill to spend time at the library and at other favorite haunts. She remembered when the train station grounds were a dump (literally), and said she loves what we have been doing to make it beautiful. She wished she could volunteer to work with us, but her physical limitations prevented that, so instead she handed us a check for $100–a big deal for our small coffers! Every year, including this one, the neighborhood kids have their eyes on the apple trees for ripe fruit. As soon as they start sizing up, they come through the gates excited to bring some home to their families. We have to be careful that we wait until they are truly ripe, but we do let them try them as they ripen so they can compare different stages. Some kids down the block from a Laotian family bring home some under-ripe fruits for processing. 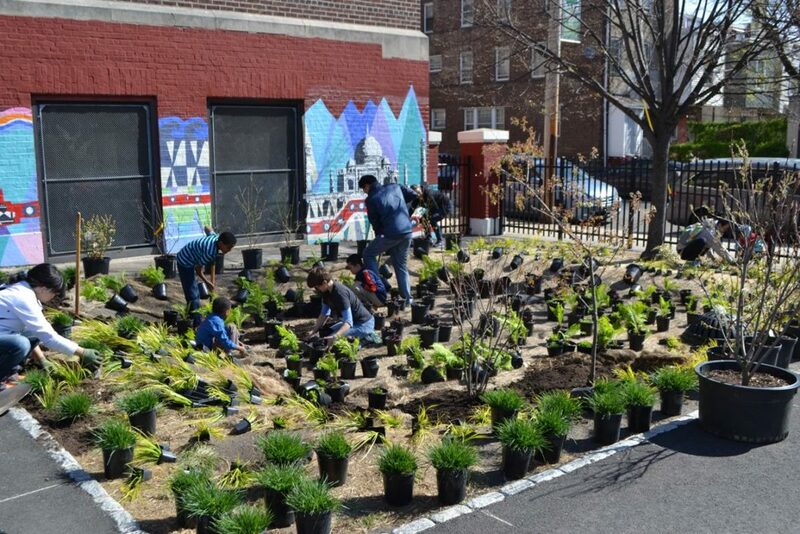 The garden is therefore a symbolic and actual source of abundance and joy for the kids and families who live nearby. Volunteers at Lea Elementary planting a rain garden including a variety of edible plants. Our orchard empowers exploration. The Edible Fruit Forest rests in a school yard. Built and supported, mostly, by the community, the school attendants, from student to staff, [initially] paid it no attention. They hadn’t yet noticed that the space being developed on their grounds was for them and their use. Now, there are teachers touring, students exploring, and staff stooping under trees for lunch, noticing and acknowledging the space in simple, interactive ways. This year, we had a lot more raspberries to harvest and share. We served the raspberries in small cups to the guests that came for meals. Most of the guests had never tried raspberries before, so they were really appreciative that we shared these fresh harvested fruits with them. It is also popular after their lunch for a healthy snack. We never felt this happy to share. We have transformed part of the farm as a seating area. This space is important for the men in the Overcomers program to have a quiet and safe place to go and relax their minds. Visitors, volunteers and staff love to use this space to have lunch, gathering, and connect. These categories of woody perennial edibles are are often considered much lower maintenance than fruit trees. As a result, it’s come to POP’s attention that they may not be receiving the attention they deserve when interplanted in our community orchards, so we’ll be working this season to highlight what to watch out for and how to properly care for them throughout the orchard seasons. Just as winter is time to prune your fruit trees, it’s also time to prune and tend your berries to ensure a boom harvest this season! Raspberries and blackberries are unique in the world of berry bushes in that they don’t have any permanent wood. Each cane (branch growing from the ground) only lives for 2 years. In old-fashioned bramble varieties, first year canes have no flowers or fruit and then bear in spring/summer of their second year. Newer ‘ever-bearing’ varieties flower and fruit on new canes in the fall of their first year and then again in spring/summer of their second year. 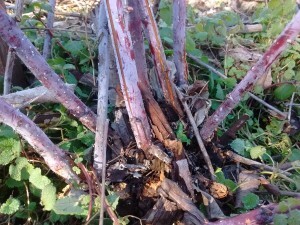 Dead second-year canes are generally easy to identify by gray/brown coloration, pealing bark, and more side-branching. Newer canes tend to have more reddish/green coloration and a more upright habit. 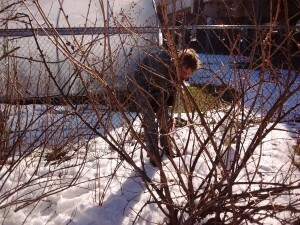 Blackberries (Rubus): In winter, remove all 2nd year canes and thin out to 8 or 10 strongest new canes. Shorten canes to 7’ and laterals to 15”. In summer, pinch out tips of new canes when they reach 3’ height. Raspberries (Rubus): In winter, remove all canes after 2nd year. Thin out weak or crowded 1st year canes. 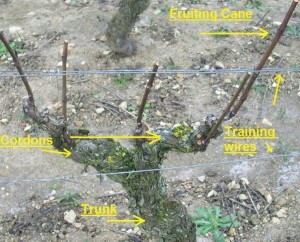 For “everbearing” varieties, shorten remaining canes to below previous fruiting. Sometimes dead canes will easily snap off or pull out of the ground, leaving your young canes behind with more breathing room. The colors of the canes often make it very easy to see what’s young and old/dead. All other berry bushes fit in this category (we’ve listed some of the ones we plant most often below). Use thinning cuts for a less bushy effect. This increases light and air circulation to the interior of plant. Remove stems that are more than 4 to 6 years old, sometimes younger for certain species. Older stems are less productive, so their removal enables younger stems to take their place. 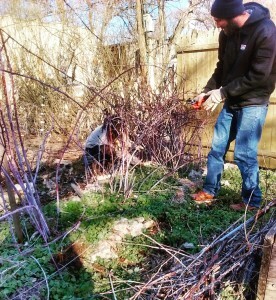 When pruning, cut stems to l-2” above crown of plant. IMPORTANT: avoid removing more than 30% of living wood in one growing season, or there will be a flush of vegetative growth as the plant tries to restore its former food-producing capacity. The same can be said for fruiting trees. 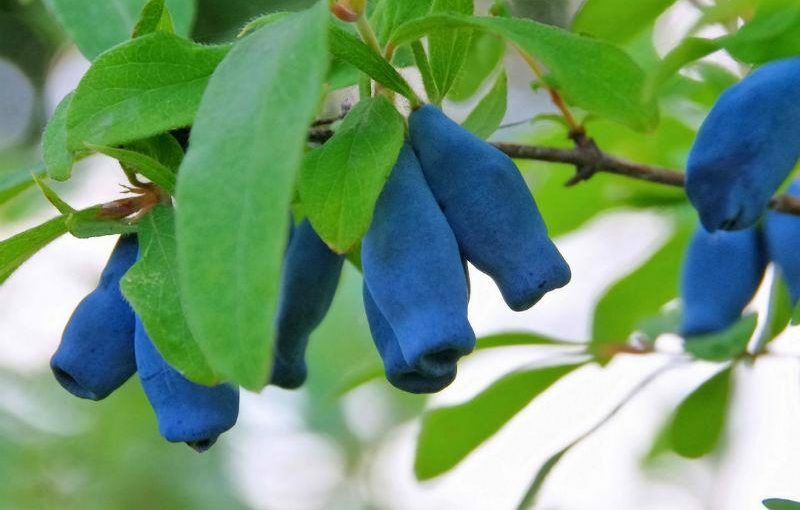 Blueberry (Vaccinium): Cut back stems older than 4 years. Currant/Gooseberry/Jostaberry (Ribes): Remove shoots after their 3rd year. Remove all but 6 new stems. 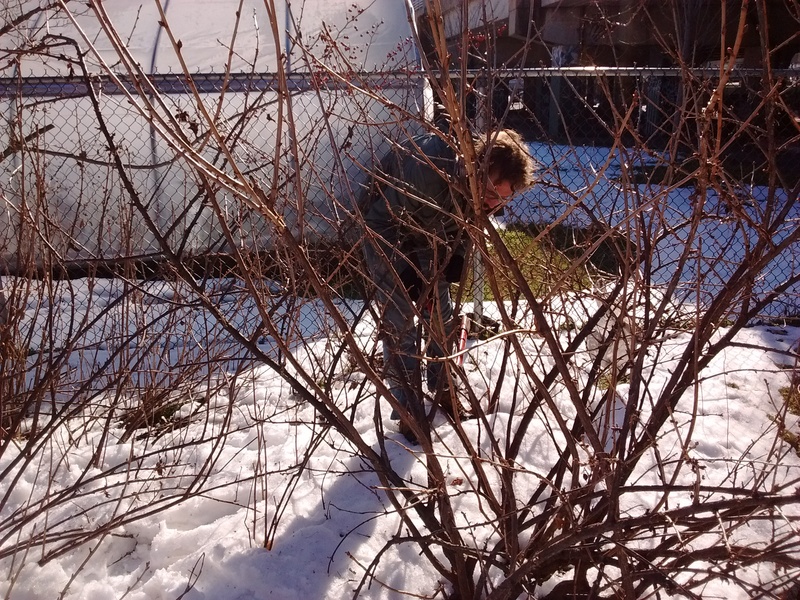 Phil demonstrating currant pruning at the Teens4Good 8th & Poplar community orchard. Remove dead and diseased wood, and then move onto removing the oldest wood and any far-reaching runners. Elderberry (Sambucus): Cut out wood older than 3 years and thin new suckers. Goumi (Eleagnus): Minimal pruning needed. 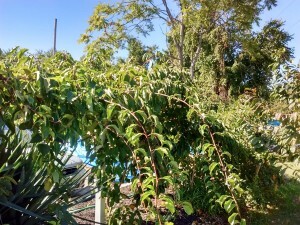 Cut back stems and suckers to desired height and girth. Grapes: During the First year after planting, simply cut to 2-3 buds. During the second year, you must select a training system. If you have 2 wires, use the 4-arm kniffin method, if one wire, use single-curtain cordon method, if you have a fence, use the fan system to utilize the area of the fence. Decide on a height for the trunk and thin the plant to a single trunk. Cut back to just over the height of the highest canes you want. If no vine reaches the desired height, repeat simple first year pruning to focus energy from the weak roots into 2-3 good shoots, one of which will be chosen next year as the trunk. During the third year select 4 vines of first year wood. Always choose thick, vigorous vines with at least 6” between nodes (places where this year’s buds will grow). Cut them to 10 buds on each, then select 4 other vines and cut them to 2 buds each. To prune an overgrown vine, select the canes to save, choosing from the canes which received the most sun during the previous season. They are usually darker in color and larger in diameter (at least as thick as a pencil). Cut Concord grape vines to the best 60 buds, cut less vigorous varieties to 40 buds (these are the maximum numbers for a mature, healthy plant, which lead to good quality grapes). Tom Zabadal has an extensive series of YouTube videos on maintaining grapes if you’re interested in learning more and expanding your production. This prolific kiwi at SHARE orchard needs summer pruning to open up its fruit to air and light! Hardy Kiwis (Actinidia): Regardless of the structure they are growing on, kiwi vines should be pruned initially to a single trunk and trained straight up by tying to a post (no twining!). At the appropriate height for the structure, the vine should then be pruned into two permanent cordons (main branches) in opposite directions. Thin out laterals growing from the cordon to 12” apart. Additional summer pruning is needed to keep these vigorous vines under control. Here’s a great video to assist and a guide with photos from Penn State Extension to read through as well.